It is week 42 of this years YOP. We have 10 weeks left to complete all those projects we talked about in July of last year. I so love this challenge we put upon ourselves each year. 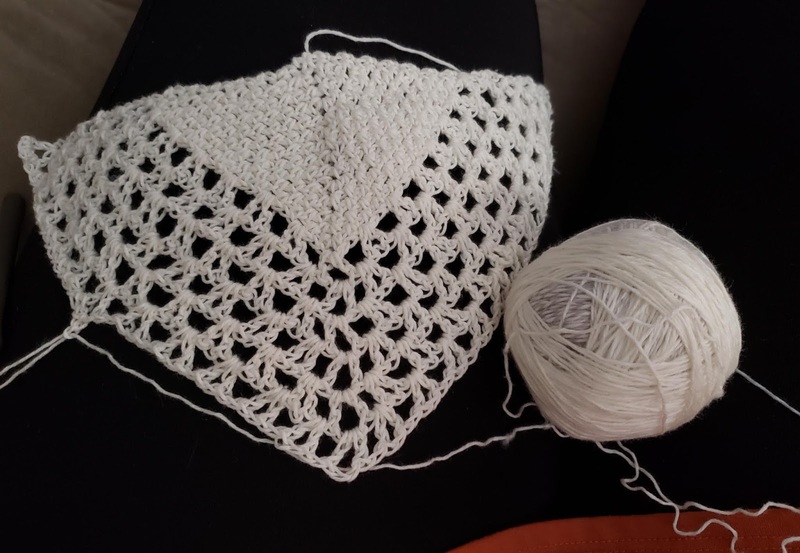 It has really helped me to improve my knitting and crocheting skills. This past week was a tough one craft wise for me. Let me give you a little photo story of what happened. Last Sunday I showed you where I was on the Mimic Shawl. I talked about the fact the top edge was kind of uneven and was hoping it would block out. Well, I realized I had not counted stitches for a while. I actually was further along than the photo above when I decided to count to see where I was. OOPS! 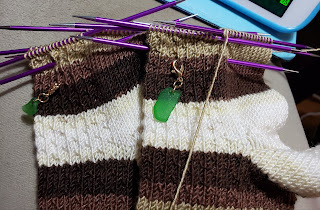 Someday I will learn to keep track as I go along and not 30 rows too late. Yup, I was way off on my count and had been since the first pattern section. So, what do you do? Frog it all the way back to where the stitch count was correct. It hurt so much to take all that out but, I could not figure out a way to make the count correct again. 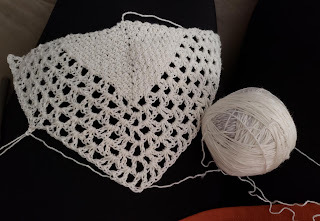 I could not add enough extra stitches in a row without it loosing its triangular shape. Adding extra rows to catch up was not an option either because of the yardage used in this shawl is exactly the yardage I have in my skein of yarn. I just sucked it up and did the painful job of ripping it back. I have worked on it a bit since that great sad day. At first, I was so distraught I did not want to even look at it but decided it was not going to crochet itself. So here is where I am as of this morning. Nice straight edges on the top. That ball of yarn is what is left from my frogging. Once that is all used, I will be where I was last Thursday morning. Hopefully, that will happen yet this week. The V stitches are the easiest since the chain 1 spaces are much easier to see LOL. As for the HES..................they saw a tiny bit of love. As you can tell from the progress keepers, they only got a tiny bit of love. 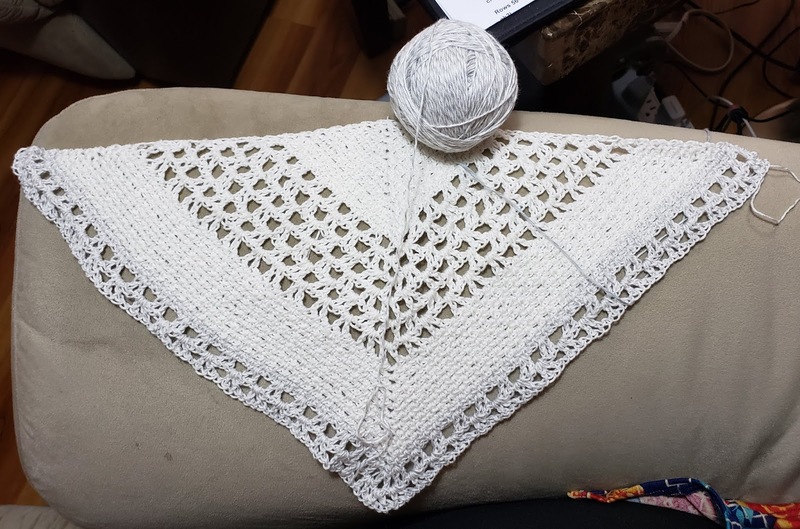 That darn shawl took most of my attention. Here is something that might help me with the socks......I bought a new purse this week that is large enough for me to carry one sock in it at all times. This way I can grab it and work on it whenever I have a few spare minutes. I normally carry a small handbag, After realizing how much time I spend waiting, it dawned on me I could be using that time to be productive instead of just hanging out. It only took me how many years to figure this out? Last night we got a gift. We had a sleep over at our house with our Grand. She is so much fun to have around. She and I played card games all night. We played several games of Rummy as well as Phase 10. By 11pm I was all tuckered out so off to bed we went. We got up bright and early this morning and have been watching the Masters Golf Tournament. We did go to Dutch Bros for her Golden Eagle Freeze (With whip) and then on to Dunkin for her Strawberry frosted doughnut with sprinkles. She has been sitting next to me while I have been working on this blog post and has been showing me some hilarious dog memes. It is always good to have a few good laughs in the morning. 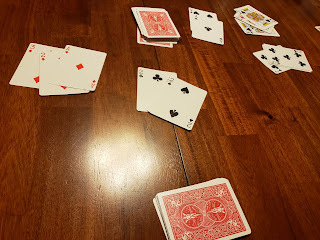 As soon as I post this blog, we are going to play more rummy. More fun!!!! You have amazing patience to be able to frog and then straight away re-knit it. I’d have to wait months to calm down before I could even consider re-starting. Sounds lovely hanging with your grandchild and playing cards and eating donuts 🍩. It's so upsetting to frog such a lot of work, but look how good it is now? You will be so happy with this. Hearing about your QT with your granddaughter made me smile. Great progress on your projects. I loved playing rummy with my mum. Thank you for that memory. Sorry about the frogging incident, but oh my it looks gorgeous. Well ... on the bright side. 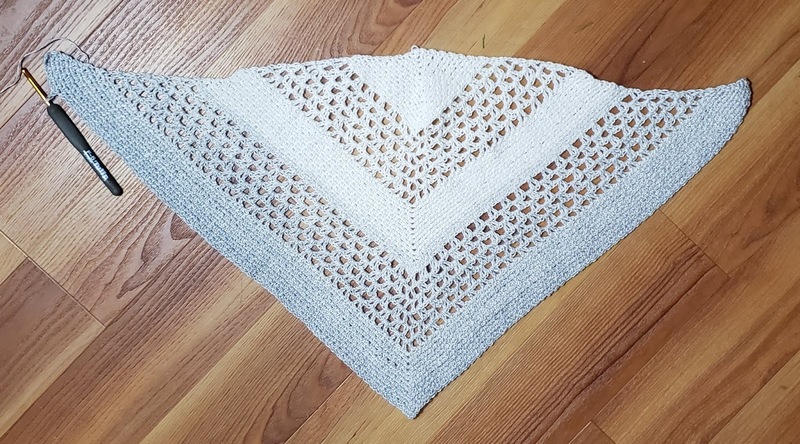 The mimic shawl is crochet and it is a whole lot easier to frog than knitting AND crochet is faster to do so you will catch up sooner than knitting. I do both crafts. I prefer to knit, but when I make a mistake, I always think, to bad this isn't crochet because the error would be so much easier to resolve. It sure is a pretty pattern. I looked it up the first time I saw it and printed it out. I think one of those is in my future - and I will remember your lesson. Count, count, count. I love rummy! My Mum loved to play card games, her Dad did also and as a result me and my brothers and sisters love to play also. We grew up learning how to play rummy, 25, and wist and all other manner of games and I have many memories about when my Mum was sick in hospital how we would always play cards with her. Sounds like you had a fun night with your Grand too. How sad it is...trust me I know. I am sure I have knitted and crocheted 'miles' with nothing to show because it got frogged. It is looking very nice and you will be so happy with it when you are done and proud of yourself too! Only 10 more weeks? I better get hopping! What fun it must be to have a grandchild you are so close to and get to see all the time. You are blessed! Aww, you did the right thing on the frogging. And you made me laugh with, "but decided it was not going to crochet itself". It's going to be lovely when you're done and all worth it. Thanks for sharing the fun with your grandchild!